Wind, waves, or a boat are kinda important when it comes to taking off on a wakeboard. At least, they were until technology allowed for electric wakeboards, a growing number of which are hitting the market. Swedish outfit Radinn first came to our attention a few years back with its Wakejet prototype, following it up in 2016 with the Wakejet Cruise that went on sale for more than $18,000. Now the company has unveiled an updated version — the G2X — that’s not only thousands of dollars cheaper than the original, but also faster and lighter, and with a few other notable improvements, too. First, more on that price tag. The G2X costs 9,900 euros (around $12,300 at the current exchange rate), well down from the 15,000 euros ($18,600) of the original Wakejet Cruise model. But yes, it’s still very expensive. The G2X guarantees a more thrilling ride than its predecessor with its top speed boosted to 36 mph, making it 8 mph faster than the Cruise. If you’re new to electric wakeboards and want to make sure you don’t end up hurtling off into the sunset, you can use the G2X’s waterproof wireless remote to set your own speed limit for a more controlled ride until you get the hang of it. The remote also has a light meter that tells you the state of the battery, and vibrates to remind you when to head back to shore, Radinn says on its website. Another significant — and very welcome — design improvement means you can now swap out the battery “in seconds” so you don’t have to wait two hours for it to charge before hitting the water again, as you did before. The battery gives you about 25 minutes of time on the water if you push it to the limit for the entirety of your ride, or longer if you take things a little easier. But if you fork out 990 euros ($1,230) for the optional XL Power Pack, you can stay out for a decent 45 minutes. There’s also an optional add-on foil that’ll lift the board out of the water as you zip along, making for an altogether different kind of riding experience. The first Wakejet machine was created five years ago as a university project by a group of students in Sweden. Radinn’s CEO realized it had potential and built a team of more than 30 experienced engineers to turn the prototype into a viable commercial product. 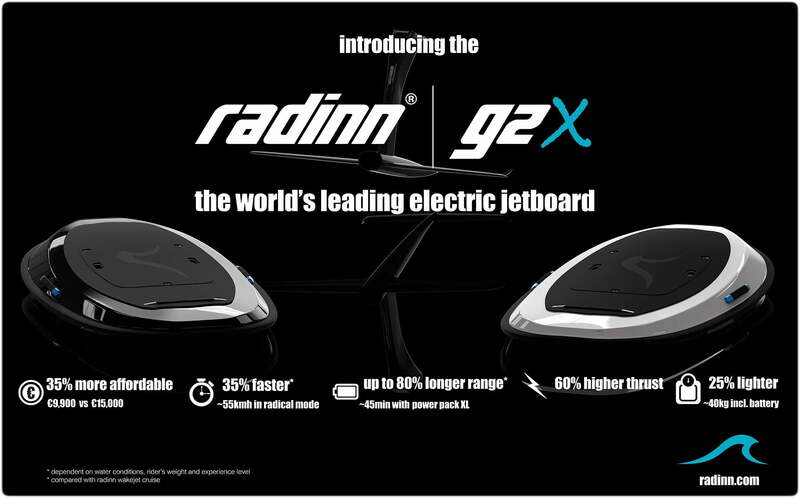 There’s certainly a lot to like about Radinn’s new G2X wakeboard, but it’s fair to say that its high price is going to prove prohibitive for many potential buyers. If it can find a way to cut it again, it could have a hit on its hands.